Heat oil in a non-stick pan. Add cumin seeds and sauté till seeds change colour. Add ginger, green chillies and onion, mix and sauté till onions turn translucent. Add French beans, green peas, beetroot, salt and chilli powder, mix well and cook for 2-3 minutes. Put potatoes in a bowl. Add salt and mash well. Add cooked vegetables, lemon juice and coriander leaves and mix well. Divide the mixture into equal portions, shape them into balls and coat with breadcrumbs. Take some dried breadcrumbs on a plate, keep a heart shaped cookie cutter over them, place a potato mixture ball in it and press to make heart shaped cutlet. Coat once again with breadcrumbs. Heat some oil on a non-stick tawa. 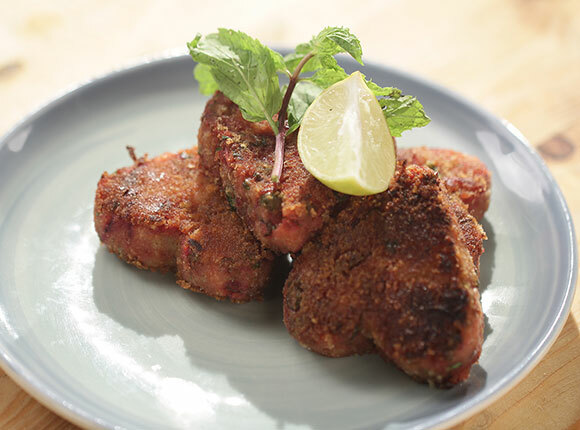 Place cutlets on it and shallow-fry, turning sides, till golden brown and evenly cooked on both sides. Arrange them on serving platter, garnish with lemon wedge and mint sprig and serve hot.